Natural law theory continues to be influential in thinking about jurisprudence. John Finnis’s 1980 “Natural Law and Natural Right” is said to have revived natural law thinking, and it continues to be reprinted and listed among top sellers in the philosophy of law. This trend is particularly important because of the claim of such thinkers to have separated natural law theory from metaphysics. On the other hand, ethicists continue to be influenced either directly or indirectly by G.E. Moore’s “naturalistic fallacy” in which Moore argued that the good cannot be defined. Since natural law relies heavily on the idea of the good, and on defining the good in relation to the nature of a thing, many ethicists in the 20th century assumed it was an indefensible theory. 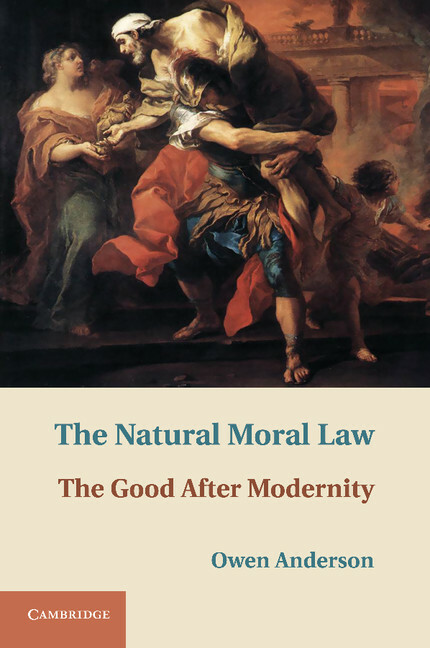 My book, “The Natural Moral Law: The Good After Modernity,” is not simply a defense of natural law thinking. This is reflected in the choice of my title as “natural moral law,” rather than simply “natural law.” The question I ask is whether there is a moral law that can be known by reason and not through an appeal to scripture or special revelation. This is in contrast both to divine command theorists who say that the moral law is known only by the command of God, and to positivists who say that the moral law is just the human law of the given region. The idea of “the good” is central to any discussion of the moral law because this law is about which choices to make. The moral law is law-like not in that it predetermines what humans will do, but because it describes what choices are necessary to achieve the good. What actions will lead to the highest end, and what actions will lead away from the highest end? My book is a study of the idea of the good, the highest end, in thinkers from Plato to Postmoderns. I argue that in each case theories of the law presuppose a belief about what is good. This means that if we as humans cannot know the good then we cannot know which law to follow and therefore we cannot be held responsible for failing to keep the moral law. Since we do affirm this kind of responsibility, we must also affirm that the good can be known. I use the metaphor of idolatry, and the image of Aeneas carrying his father Anchises with the household idols from the flames of Troy, to illustrate the implications of false beliefs about the good. To pursue an idol is to pursue a false good that bends and warps all of life. To build anew after the destruction of Troy while relying on the same useless idols is to guarantee failure of the new city. My claims about the good are still very broad, and I must conclude by relying on Socrates. In his defense (given in the Apology), he argues that the good for a being is based on the nature of a being, so that the good for a horse is based on the nature of a horse, etc. I aim to make the human good more concrete by defining human nature more specifically. Ultimately, the implication is that competing theories of the law are due to competing theories of human nature and the human good. We are currently in an election year cycle in the U.S., and this means that differences about what should be law are all the more prominent in the popular media. And while differences in theories of human nature and the good are fueling these competing theories such differences are left out of the discussion. My aim is to explain the power of these assumptions and expose their influence in public and individual choice.